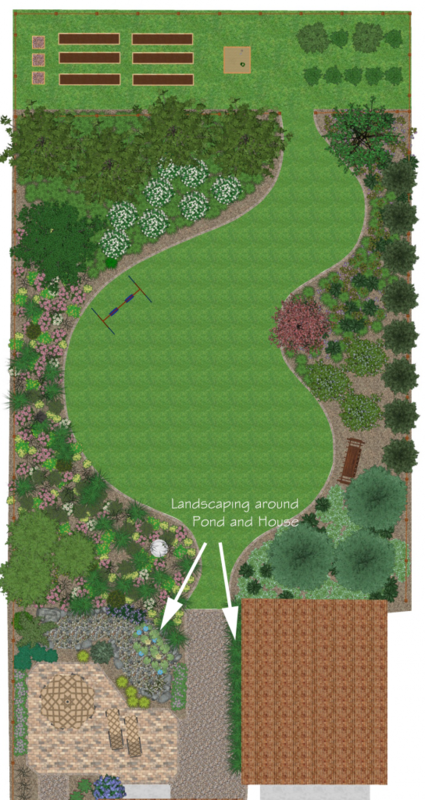 Last post, I started a backyard landscape design with a Prairie and a Pond. 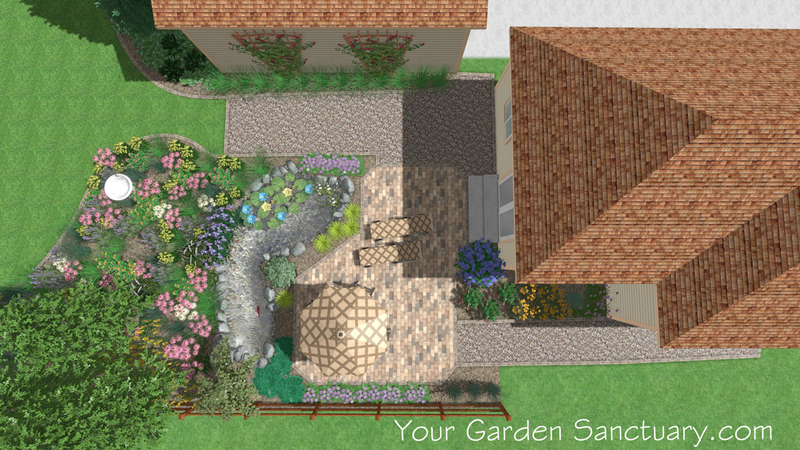 Today, we finish it by adding shrubs, perennials and accessories. Here is how it looked when we left off last time. In our food production area, we are going to plant 6-10 dwarf fruit trees/shrubs. North Star Cherry will certainly be in the mix, as will several of the dwarf columnar apple trees that are available. We will pick the most disease and insect resistant cultivars available that match our growing conditions. It still looks like something is missing. So lets add the ground plants including the prairie in the back yard. The prairie or perhaps meadow may be a better term, composes most of the bed space in the backyard. It will be inspired by the Tallgrass Prairie. 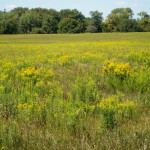 While those Prairies typically had hundreds of species of plants, our meadow will be much less diverse. We will only select plants that are aesthetically pleasing. Yes, they will still all have high ecological value, but they will also increase the beauty of the meadow through the seasons. 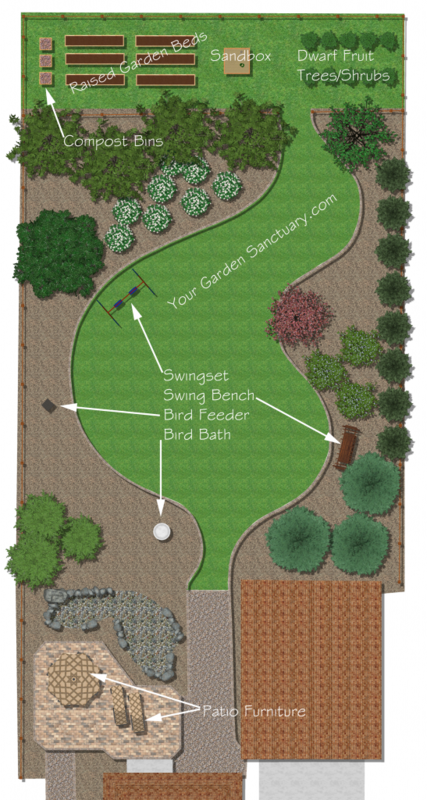 Here is the backyard landscape design from a bird’s eye view. 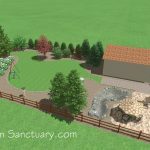 While the meadow will be a large part of the landscape, it is only 800 sq ft which is huge for a garden bed, yet pretty small for a meadow. While most meadows are established using seed, this is a long term process that takes at least 2 to 3 years before it starts to reward you with flowers and less care. If we plant with plugs and perhaps some 1 gallon plants, we can have a realized meadow planting in one year. The trade off is higher upfront costs. 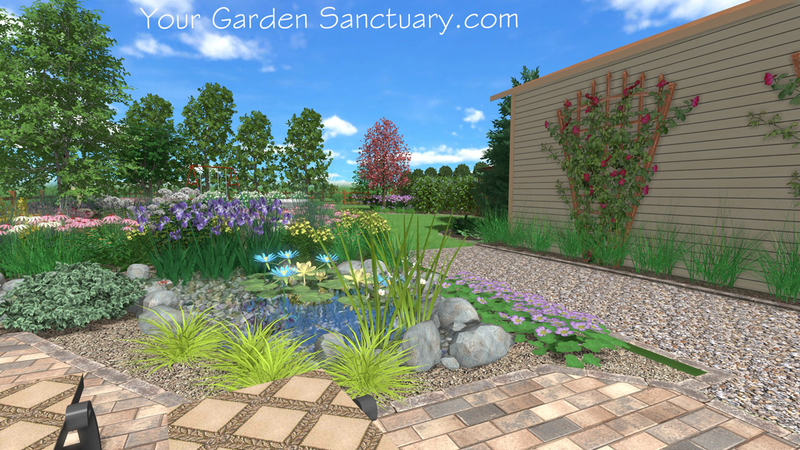 Using plants will also allow us to design the original layout of the plants. This will definitely help us increase its aesthetic value. Although this will be a living system that will change through the years with plants moving, dying out and re-appearing. This is part of the magic of having a meadow. If we space the plants 1 foot apart, that is 800 plants. You may be thinking 800 plants sounds awful expensive. But if we use plugs with perhaps a fewer larger plants for the slower to establish species, such as Baptisia we could get the cost down to $3 per meadow plant that would equate to $2,400. If we increased our average spacing to 18″ apart, we would reduce the number of plants down to 356. Assuming our average $3 plant price, this would drop our meadow plant cost down to $1,068. Of course with wider spacing we will require more maintenance in terms of weeding, as the plants fill in. We could incorporate some seeding of native annuals to get weed suppressing coverage more quickly. 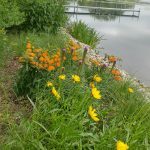 For instance, Indian Blanket (Gaillardia pulchella) and Plains Coreopsis (Coreopsis tinctoria) are two native annuals that can fill in gaps where weeds would like to grow, provide flowers the first year, and reseed to fill in gaps in later years. Eventually these annuals will fade out of the meadow as the longer lived perennial plants get established. 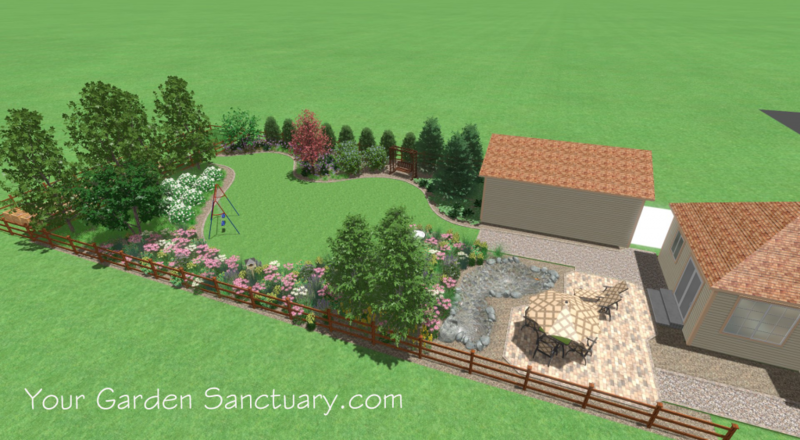 The costs of the meadow does not include any of the other plants in the design, so no, this is not a cheap design. 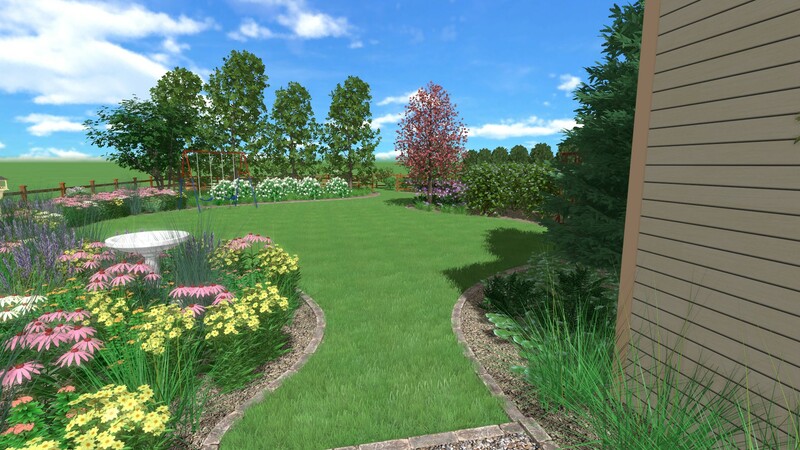 However, the costs of using typical landscape plants for this size of an area would not be cheap either. 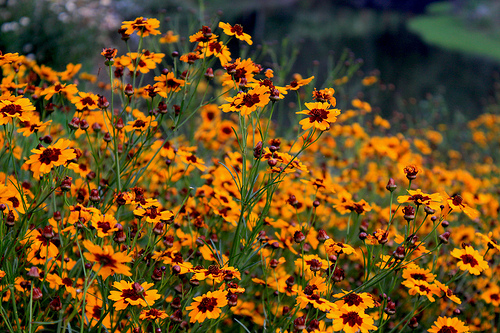 However, once established the meadow will require less inputs like fertilizers, pesticides, and mulch. You might say those don’t cost much. 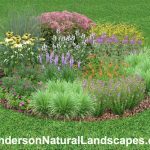 Let’s take a quick look at just what mulching a normal landscape bed this size would cost. Sure in our meadow planting we would want to mulch the bed with leaf mulch the first year but this is often available free or for low cost and is much easier to apply as it is lighter. It’s actually kind of fun throwing around shredded leaves, so we might even do it ourselves. Say the the meadow area was planted with typical landscaping. We would typically put down 3″ of hardwood bark mulch the 1st year and another 1″ every year thereafter. That would equate to 7.5 Cubic Yards the first year and 2.5 every year after. In my area that would cost at $70-$85 per cubic yard installed, we will use $70 as an example. The 1st year mulching would be $525 with another $175 every year after. That’s not nothing. The meadow is only half the yard’s ground plane. 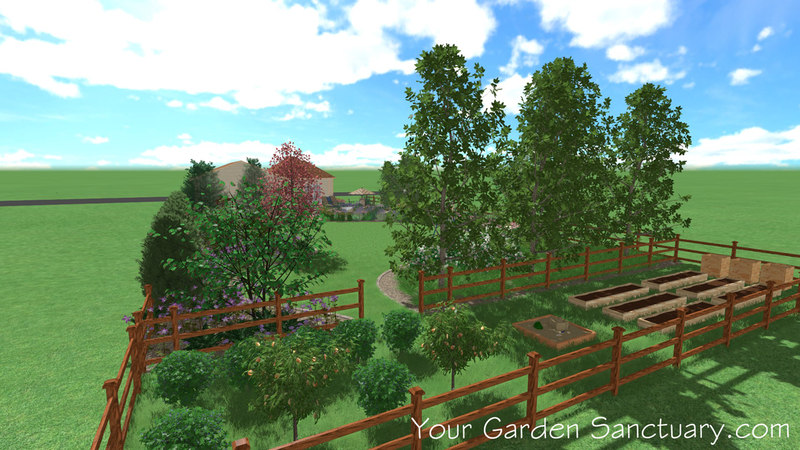 The other parts of the yard will experience more shade, so we will need to vary the plants selected for those areas. We will plant small plants here too, because we will have a lot of plants to get in the ground and smaller plants are usually a better deal. We will not go into the specifics too much, but we will be a bit more conventional here. 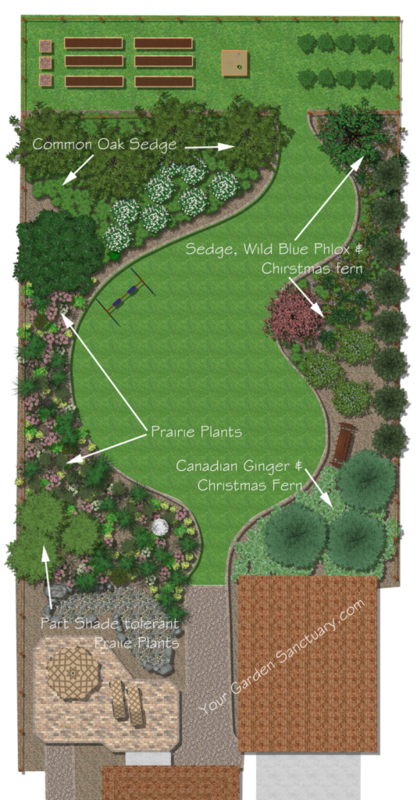 We will include a lot of the native plants that are in the rest of the landscape, but may select named cultivars that are smaller, denser, flower longer, etc. 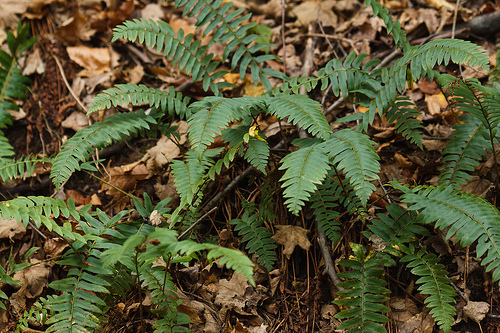 We will also include non invasive non native plants. For instance, upright Sedum’s such as Autumn Fire (better than Autumn Joy, stems are sturdier and it flowers longer) are great butterfly plants that don’t escape the garden. Not sure why landscapers and landscape architects have not figured this out. Everybody still specs Autumn Joy even though Autumn Fire is undoubtedly better. The climbing roses on the side of the garage could be substituted with another vine that would require less care if desired, perhaps even annual vines. View from the back of the yard. Well Done Jim, That’s an amazing design and was a pleasure to walk through.